Why stay at Big Bear Hostel? Hostels started as a way for European students to travel on the cheap during Summer break. This tradition continues as students travel the world during vacations. Some students even take a "gap year" and travel for a year before or during college years. Today hostels have matured into communal lodges which offer many benefits over "boring" hotels. Big Bear has endless fun things to do! Meet people from all over the world. Save Money by cooking your own meals in our Full Kitchens. Best location in Big Bear! Walk 1 block to Village Shops / Restaurants / Pubs / Visitor Center. Our Party Deck w/BBQ has a Million Dollar Lake and Mountain View! Free WIFI and internet computers. 24hr hostel access. Free parking everywhere in Big Bear. Quiet hours after 10:30pm - so you can sleep! Bars down the street open until 2am - so you can party! 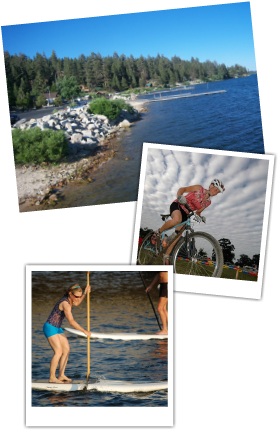 We are experts on all things to do in Big Bear - Free Information. Coin laundry machines w/free soap! Amazing Ski / Snowboard Lift Ticket Packages! Half Price SKI, SNOWBOARD, BIKE, KAYAK RENTALS for our guests! Kayak / Canoe Tours and Rentals.